I was rummaging through my sewing room, looking for ... well, whatever I was looking for. What I came across instead (one more time) was a "kitted" project ... the pattern and fabric were neatly packaged, simply waiting for me to stitch it up. It was early 2014 when I first saw it. The freebie pattern is "To Eternity and Beyond" and was designed by Wendy Sheppard for Benartex. Amazingly, it is still available here, along with other, similarly themed patterns. I don't know if the space fabric is still available, though. Since I know that specific fabric tends to have a short shelf life, I immediately set to ordering all the fabrics specified on the pattern. I needed to order from several different online stores. But, get them I did! And then, I packaged the fabrics and the pattern together and stored them on a shelf. For a later time. Well, that "later time" came today. Although in over-all time, it took me about 12 hours to sew together, if you subtracted the meal times and other distractions, it really didn't take that long at all. It's all straight seams and the most "difficult" part was the construction of the half-square triangles. 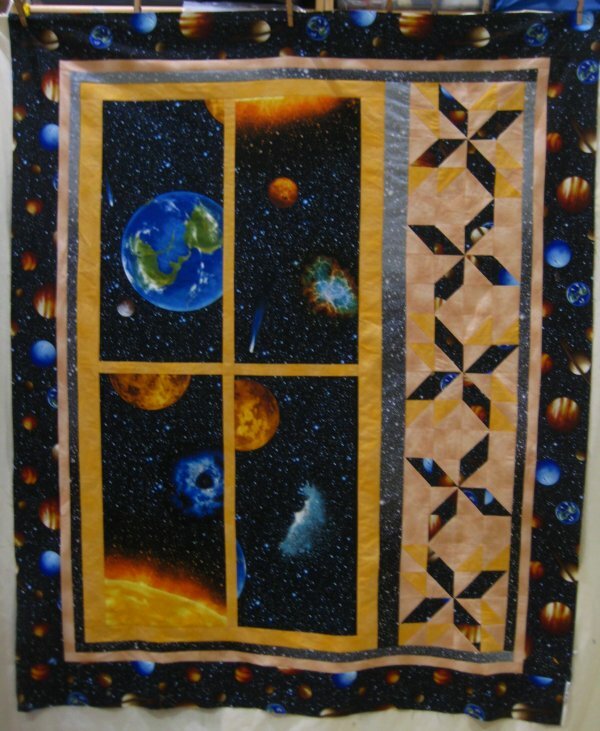 I had been able to devote the time strictly to sewing, I bet I could have finished the piecing in a single afternoon. This photo isn't the greatest .... the top isn't really as wavy as it looks; there are bumps underneath the sheet that the top is pinned to. I tend to finish a lot of my tops late at night and want to share my accomplishment RIGHT THEN! I don't *want* to wait until the next morning when conditions would be better. Which means horrible lighting and a less than optimum setting! Oh ..and the name? Well, it harkens back to a *fantastic* but short-lived scifi TV show called Space: Above and Beyond that I and my far-flung online friends were rabid fans of.